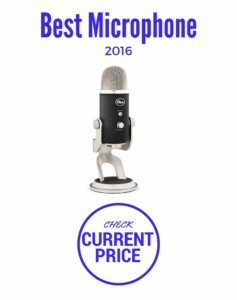 What's The Best USB Recording Microphone for 2016? When you have a mic that has thousands and thousands of 5 Star reviews on Amazon you know they’re doing something right. Sure enough it doesn’t get any easier than the plug-n-play perfection of our pick for the best USB recording microphone series..the Big Bad Blue. If you’re looking for an instant and dramatic increase in your quality and sound look no further. 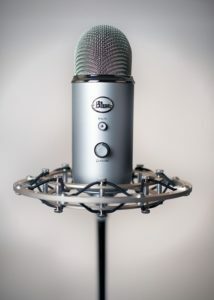 Blue’s Yeti is an amazing value which offers features that just a few years ago would have cost 5-10x the price. Having that power and technology available in your home with the click of a button will make it super simple to just focus on your singing performance. You’ll be blown away by how amazing the quality is when you play it back. USB mics have grown up in a big way. The most popular color of the Yeti is silver most although it does come in an assortment of ‘flavors’. 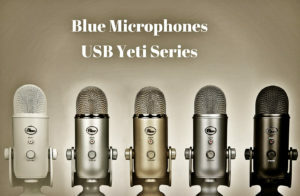 Visually they are practically identical to the Yeti Pro, which is our top USB microphone for recording vocals on our top list, the only thing different is the Yeti doesn’t have an XLR input. It’s a straight up USB Microphone for recording. The sensitivity and design are so well done that you’re probably going to pick up some desk noise. It does have grip pads on the bottom to provide some isolation of the vibration but it’s not a shock mount. If you’re the type who gets expressive when you sing then we highly recommend this shock mount which is made specifically for this microphone (you’ll thank us later). The radius control is on the speaker side and the mute button with the headphone monitor volume as well as the red activation light is on the far side. Check out this article on differences between USB and XLR microphones for a quick synopsis of how the technologies differ. But the real plus of the Yeti is that it literally is just plug and go. All it needs is a little calibration, to get the sound right for your situation, and it’s off to the races. It is completely self-contained so it operates as it’s own ‘mini-studio‘. Making it the best USB microphone for recording vocals and singing. The zero-latency monitoring takes it over the top. It offers four different recording patterns that are made possible by the three premium condenser mics arranged inside the housing. Cardioid Mode – if you’re doing podcasts, vocals, or singing it records directly in front of the microphone. Omnidirectional Mode – picks up the sound 360 degrees around the microphone giving it the feeling of a live recording (just like being there). Bidirectional Mode – Captures the sound from both the front and the rear of the microphone. Good for interviewing or getting a musical instruments nuance. 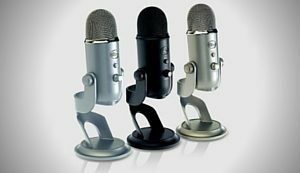 So Are USB Microphones Good For Recording Singing? The only bad thing that we can say about them is that they are so good you’ll want to use them everywhere. If portability is your goal you may want to check out our best wireless microphone for singing or our top pick for best microphone for live performance as they both fall under the ‘grab-and-go’ category. 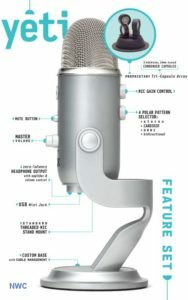 Even though this member of the Yeti family didn’t make our top microphone for singing list if you don’t need an XLR input, then this is the mic for you. But don’t take our word for it go check out the 3500+ reviews on Amazon. Get the word from users whom we’re sure would agree that when it comes to vocals the Yeti is the best USB recording microphone in 2016.